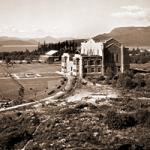 "The History of the University"
"Higher Education in British Columbia Before the Establishment of UBC"
All UBC Publications are included in UBC Library’s Open Collections portal. These are digitally-scanned copies of newspapers and other periodicals published at the University of British Columbia. These include campus-wide and community publications, faculty/department-level periodicals, and student publications. Collectively, these publications comprise more than 67,000 pages that chronicle the historical evolution of the University.